I find it looks good.... That frittata must be delicious! It looks perfectly rustic and delicious! I love frittata! And your looks absolutely mouth-watering. My favorite one is Potatoes and Onions :) I simply could not resist. I think it looks GREAT! Roasted vegies are the best! Baked in a frittata they must be fantastic! Mmm I think it looks awesome! 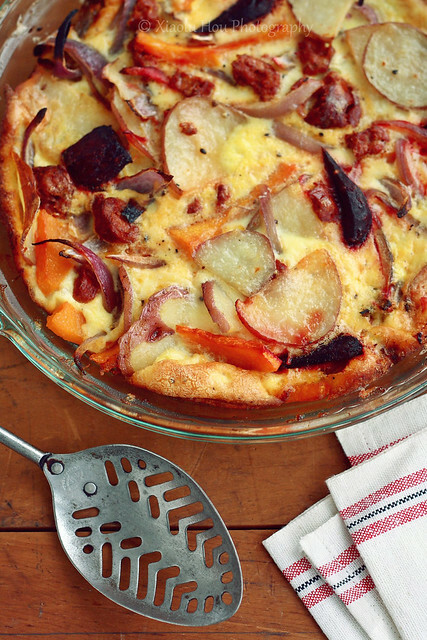 I love frittata, and love the combination of veggies you used here. Awesome. Personally I think this is very pretty! It shows a combination of fine ingredients and the colour is perfectly cooked. Save me some! Haha! I just posted some commentary on 'ugly food' ... my quandry as a blogger is to photograph finished result or just leave it at ingredient photos ... we love frittatas also! My fave is asparagus, sweet onion and Parmesan. Incidentally, your frittata is a lovely rustic dinner! I haven't tried making frittatas at home yet but they seem to have quite a fanbase in the blogworld and this one doesn't look disappointing in the least. Still looks gorgeous to me! Anything you make will look pretty Xialu. I am it is delicious too. You did a beautiful job with all of those brown and orange ingredients! The whole photo feels so autumnal. You are too hard on yourself! I think this is SUPER pretty, and it looks delicious too. I love the addition of beets. I've never tried that in a frittata. Your Fritatta looks absolutely pretty and tasty! Thanks for the cupcakes and taking the trouble to bake for all of us. And very nice to have met you. I indeed looks very good. Oh and healthy! Got to love a good frittata, and u do have some talent to make food look attractive. love the colored veggies that you used here. I love mushrooms, asparagus, sun dried tomatoes in oil, peppers, lots of black and crushed pepper and some good herbs in my frittata. For some reason I never thought to sub chorizo for a veggie version, ugh, so many recipes to try out now! Susan - As I've learned more about food photography/styling I have realized that while some foods are more photogenic, there are few "ugly" foods that can't be photographed to look appealing or at least visually interesting in some way. My goal now is to learn how to do that for a wide variety of foods, especially the ones conventionally thought of as "ugly" :). Your frittata sounds delicious! Sandhya - It was my please to meet you and I can't wait for the next meet-up! Soma - Thank you and your frittata add-ins sound so good I think I must make that version next time =D. I think that frittatas are a delicious way to get as many veggies as you can into one dish. I like to make mine with lots of fresh herbs too, they end up looking very green! I disagree, Xiaolu... I think this looks plenty pretty. And it sounds delicious too! In your hands, EVERYTHING is pretty! Yummy. It is very pretty and it is tasty :) I am sure of that. What did I do wrong - I made one the other day - same eggy ingredients, but with just te chorizo and cheese - what a disaster! This looks like rustic heaven! EA - I'd love to hear what you think of it if you try it :). I've made the spanish tortilla before too though with much reduced olive oil (I know it's not longer authentic but I can't stand to use half a cup! It's still quite delish with only a few tablespoons of oil though thankfully. What are you talking about, the photo is gorgeous! And the frittata looks perfect.